Though all fire extinguishers do one primary function, to put out A fire, they are not all the same. By knowing which types of fire extinguishers to use for a certain type of fire, you can avoid doing further damages to your property and most important of all, to yourself. Before you check out the different fire extinguisher types available for purchase here at Local Fire, it would be best for you to get acquainted with the different types and uses of fire extinguishers. Water extinguishers, also called water cans, are perhaps the most popular types of fire extinguishers. They are commonly found in commercial establishments and educational institutions. Typically, this kind of fire extinguisher only contains pressurized water. However, there are also some water extinguishers that contain Aqueous Film Forming Foams or AFFF.These foam extinguishers are used for covering oil fuel spills. They help smother the fire as well as keping the area cool. A water extinguisher is primarily used for fires caused by, cardboard, wood, or paper. This type of fire extinguisher should never be used for electrical fires, chemical fires, oil fires, etc. Doing so may only result to the worsening of the fire. In the case of electrical fires, using water extinguishers may result into electrocution. Among the different fire extinguisher types, dry chemical extinguishers are the most versatile. They can easily stop fires caused by grease, oil, gasoline, or other forms of flammable liquid. Aside from that, they can also knock down cloth, paper, and wood fires. Because of this, dry chemical extinguishers are usually used in chemical laboratories. Their only downside is that they leave a certain type of nonflammable substance that can irritate the lungs and the throat. However, this nonflammable material effectively prevents the fire from re-igniting. CO2 fire extinguishers are primarily used for stopping electrical fires from spreading and doing further damages. Aside from electrical fires, a CO2 extinguisher can also effectively prevent fires caused by paints, alcohols, solvents, acetone, gasoline, and so much more. It should be noted that this specific type of fire extinguisher should never be used for Type A fires (fires caused by plastic, wood, cardboard, paper, and the like). Instead of knocking down the fire, CO2 fire extinguishers may worsen it instead. Also, when the carbon dioxide released from the extinguisher already disappears, there is a great possibility that the fire could re-ignite. As such, under no circumstances should a CO2 fire extinguisher be used for Type A fires. These are the three primary fire extinguishers types out in the market today. If you are looking for a reliable and trustworthy provider of fire extinguishers and other fire protection devices, then look no further. 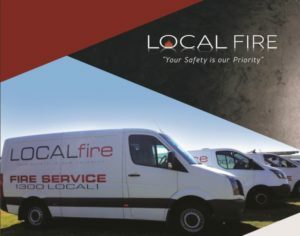 Local Fire has everything that you need whether what you are looking for is a water extinguisher for your home, a CO2 extinguisher for your work place, or a dry chemical fire extinguisher for your laboratory. As a trusted provider of fire protection devices, you can be certain that the fire extinguishers you will purchase from Local Fire are of superior quality. Make sure you browse our pages further for you to find the right fire protection devices for your specific needs.